I’ve been pretty busy preparing for the consignment sale I sell at. This is my 3rd time selling. Here are my steps to getting ready for the sale! First, I clean out my bins. 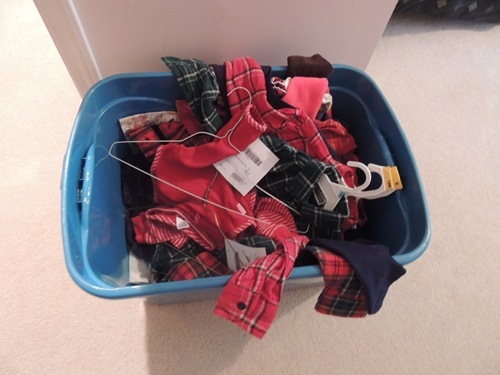 I had so many bins to go through to see what needed to be donated, hung on wire hangers for the sale, or saved. 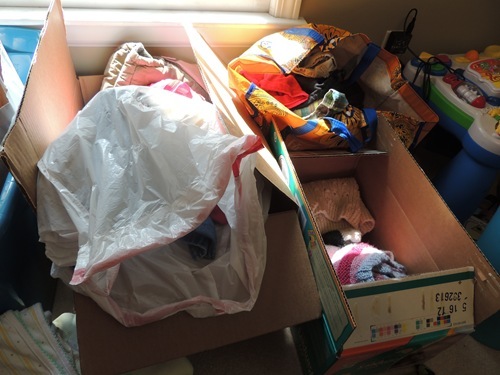 This was a bin of leftover items from last winter’s sale. 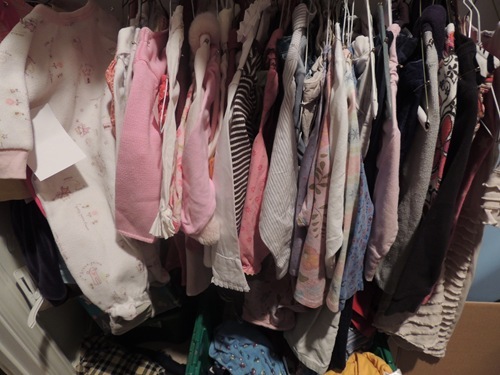 Some of the things didn’t sell and some were rejected for what I felt were not valid reasons (like flannel shirts that were rejected for being “worn” – I think they’re supposed to look that way!) – so I’m trying to sell them again! I always mark my clothes to sell for half price on the last day of the sale and some things will be a really good value on that day, so it makes me wonder why they didn’t sell last year! Here are some of my things hung on hangers. These are my sort piles of donation, needs a cleaning or a match, save for the summer sale, and keep. Now I sort all the clothes by size. I do this in my guest room closet. Gabbie wants this to be her room and therefore her closet, so I may not have this convenient space next year! Anyway, I used to sort the clothes by size after I entered the tags, but this way the tags are in order by size too. Except for that last bin I found after I’d already entered everything! 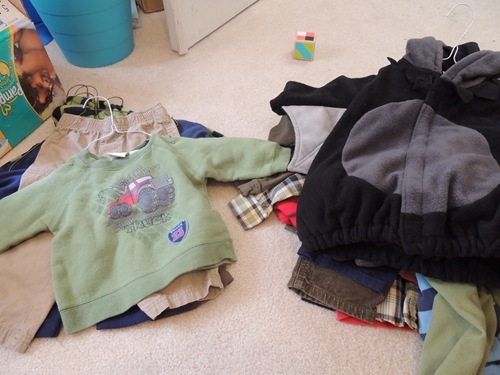 In the future I think I will sort the clothes as I remove them from the kids’ closets! 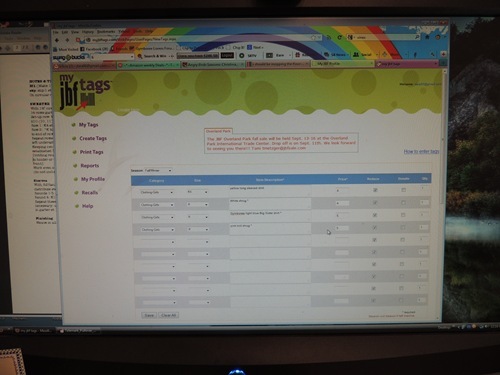 Next it’s time to enter my tag info. It is all pretty self explanatory on the program and I’m so glad I don’t have to do anything by hand! 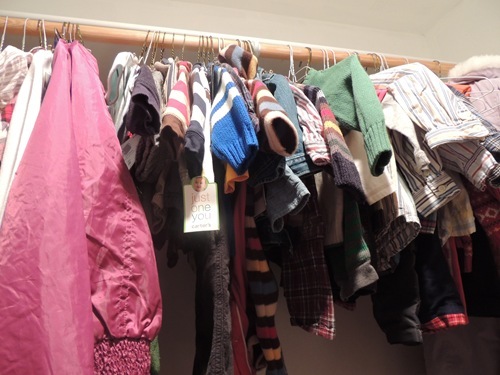 I enter descriptions of my items and I’m sure to be clear on what I’m describing – for one thing I can see what has sold online each day of the sale, and also if my tags are separated from my clothes they may be able to be reunited! I also sell for my good friend, so on her items I add *s, that way I can tell whose items are whose easily. Sellers choose their own prices, so I make sure to price my items at a price I’d be ok with even when divided in half if it sells on 1/2 price day! Plus, I lose a percentage of my sales to the company, so I don’t get the full return even if the item sells before the last day. I print out my tags in groups of 6 and then they need to be cut apart. I put a certain 5 year old to work doing this. 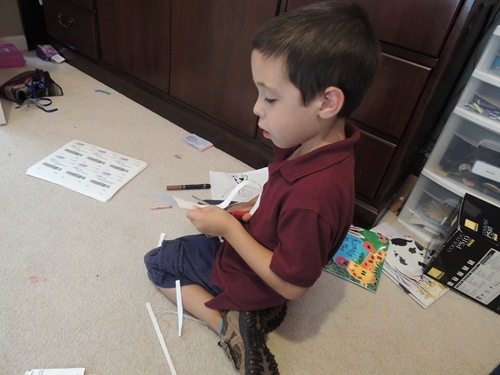 He managed to cut up 2.5 sheets for me. I did the rest. Oh well. See the ones with the jagged edges? Those are the ones Zachary cut! My best investment by far into supplies for the sale has been my tagging gun. The people that run the sale sell all the supplies so I got it from them. Each season I need to get more tags – they are $1 for 200, so not a bad deal! 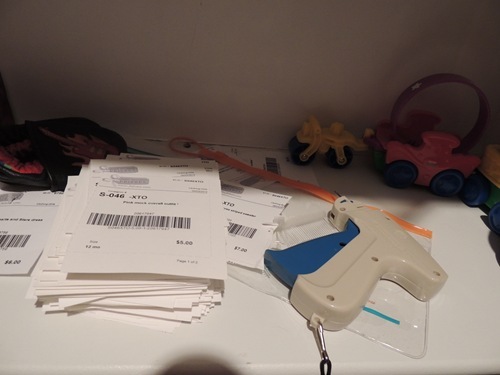 I spent this afternoon in the closet attaching tags to clothes. I’m not done yet. I ran out of safety pins yesterday and had to buy more today, so before I can finish tagging I need to hang and attach more clothes to hangers! Then I have to zip tie some shoes together and make sure everything is in order. Drop off day is Tuesday. All this takes about a week’s worth of nap times / evenings. Is it worth it? I have made $500 in a previous sale, so I think that one was worth it. I have to see how I do this time! Anyone else out there sell in consignment sales?